i thought we would have a long wait. but the place is pretty big inside. they have a really cool banquet room. we ordered there 16' Chicago deep dish, it takes a little longer to cook but it was worth the wait.....0utstanding flavor.... definitely a must place to try. They have a really nice bar inside . you can either eat in the bar or in there dining room. We did not eat in the restaurant itself so I cannot rate that at all. We did the original and thin crust pizza, both were very good especially the thin crust. There was a little longer wait than expected but the 2 cashiers in the carry-out area were very friendly and outgoing. Unfortunately the location isn't totally convenient for us otherwise we would get this 'za more. Recommended. 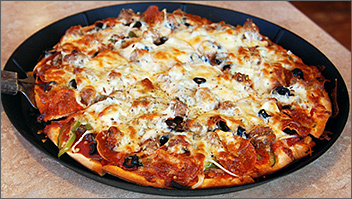 I went to eat at Rosati's Pizza which is located on the far East side of Green Bay. It is located in a brand new upscale strip mall; everything inside is brand new and immaculate. The interior is done in a contemporary décor with red and cream colored walls, field stone accents, and wood flooring. My server was from Italy and was extremely outgoing with a great upbeat attitude, she made my dining experience so much more enjoyable. She is the only employee from Italy working there, and I did notice that the other server working that day was also very engaging with the other customers. 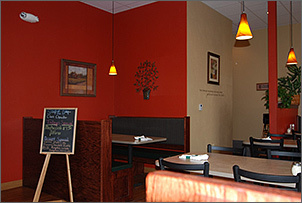 The servers gave Rosati's restaurant a more personable and homey atmosphere even though it is a pizza chain. I ordered their Monster Salad for $7.95 and a 12 inch thin crust Super Supreme pizza for $17.95. 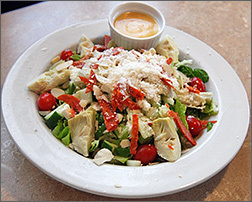 My salad was very large and fresh; the romaine lettuce was nicely chopped and consisted of sliced pepperoni, Feta cheese, grape tomatoes, cucumbers, artichoke, green pepper, Parmesan cheese and slivered almonds. The portion of the ingredients was more than sufficient and was evenly mixed. For my dressing I chose Italian which was served on the side. The dressing was nothing special and had more of a white vinegar taste. With my salad I was served warm bread rolls in a basket with butter patties; the rolls were delicious, dense, and moist. The pizza looked great with a thick melted covering of Mozzarella cheese on top. The supreme has sausage, pepperoni, mushrooms, onion, green pepper, and black olives. It had a lot of cheese and nice amount of sausage but the other ingredients were modest in portions and they use canned mushrooms instead of fresh. The crust had a nice texture with the dough and cheese flavor standing out the most. They are in the process of expanding the restaurant by adding a full bar with more seating, currently they carry beer and wine.